The Collection of Historical Bridges is part of the Tentative list of Iran in order to qualify for inclusion in the World Heritage List. This nomination is actually more interesting than it sounds on paper. I visited Dokhtar Bridge in the town of Pol-e-Dokhtar, which means “Bridge of the Daughter” so the town's name is the bridge. I don't know what is older, the bridge or the sign to explain it. It is ancient but I suppose the bridge from the Sananian Empire (224 to 651 AD) probably beats it by 1,500 years. I even found an article on Livius.org that explains some parts, including the theory that it “is probably named after a daughter of the builder of this bridge, the Sasanian king Shapur I (r. 241-272)”. The bridge is not in good shape today. The biggest remaining arch has the main road going through it. There are supposed to be 15 arcs left in total but I can only count 7 or 8 on the other side of the river. Parking myself next to the huge arc with a gravel road leading up, it bends around and then just drops off into the river. Scary that I'm allowed to walk up here without a warning sign, or shall I say thrilling that I can get up the edge of the bridge!? The path is filled with mud so maybe that was trying to put me off but it was frozen solid. There is actually safer parking on the other side of the arc next to the river and the you just have to run across the … hmm I did say it was safer but that is safer for the car not parked below potential rocks falling. You can get a better look at the other side from the river parking but I didn't want to bother stopping again. What I found impressive is that the bridge is so wide. It surely rivals the Roman bridges in usefulness but apparently not so much in long lasting. It was apparently already repairs several times but I think a modern repair would actually fix it for good. Problem is, the bridge leads to nowhere nowadays. It would only serve as a tourist attraction. Also there are no rails or sides at all. How many people or carts fell off back I'm the days? Additional safety like that would ruin the ancient bridge's look. It would still be a great walk across the bridge. Dokhtar is 2h from Shush and 3½h from Bisotun so not exactly close by but it is kind of on the way if you travel between these two places, especially if you are also visiting Kermanshah (Taq-e Bostan). If you feel up for exploring there are a dozen of bridges according to the documentation but I don't know where they are all supposed to be. 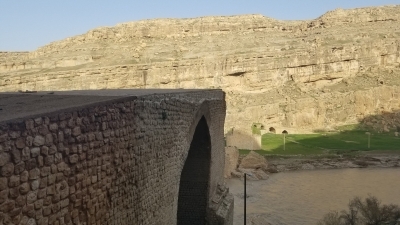 By the way this is not “Dokhtar Bridge” in West Azerbaijan, referred to as Kiz Bridge, which was maybe also built by the Sassanid era but not mentioned in the documentation because it is not certain to be in the same exact style? Still worth a look as well.